Move over, cranberry sauce. I don't know how well this cheese would pair with turkey and stuffing, but I'd rather see this stuff on my Turkey Day spread, personally. In my opinion, this is the best fruit and goat cheese pairing possible. It's the double dose of tartness that gets me. Sure, there's a good bit of sweetness from the cranberries—both natural and added, but by and large, this is a mouth-puckering, tart, tangy, sour patch people, spread-on-bread but preferably water crackers kind of snack here. Pairs nicely with a malbec or merlot. I just looked it up right now and wine people are telling me that it goes best with a Cabernet Franc. If they say so. I've never even heard of it. Cabernet Sauvignon? Sure. I'm learning to appreciate sweeter chevres like blueberry vanilla more than I did in years past, but every time I try them, there's still this notion that "blueberry vanilla" should be an ice cream flavor, not a goat cheese flavor. When I taste this stuff...I feel like this is why God invented goats. There's the perfect amount of smooshed, dried cranberry matter all around the outside of the cheese. If it's straight outta the fridge, it's a bit difficult to spread. I think the flavor comes across a little better, too, when the cheese has been left at room temperature for a spell. 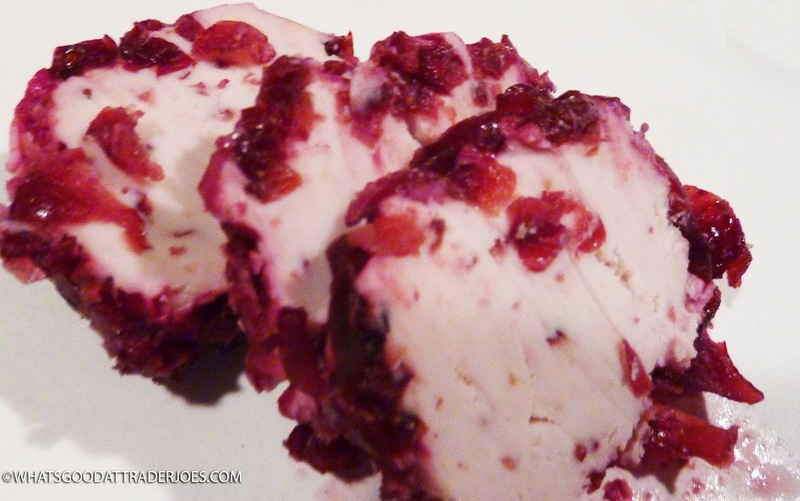 Most of the time, the cranberries stick to the cheese pretty tenaciously, yielding a well-balanced cheese to berry ratio in each bite. Water crackers provide the best neutral venue for this chevre to shine—not just flavor-wise, but the crispness serves as the perfect foil to the cheese's smooth creaminess. Sonia liked the cheese, too, adding that the product has a melt-in-your-mouth quality that she wasn't expecting. "It feels like a fall food since it's so cranberry-ish," she said. Four stars from her. Four and a half from me. Happy Tofurkey day to you and the family! My favorite way to eat this is on sliced apple - honeycrisps or similar. The flavors and textures contrast nicely.